In eight years Chris Newton has grown from a laptop and mobile phone to a law firm aiming to be in the top 200 in the country. Mark Casci reports. Within the next few weeks it will open a further three offices across Yorkshire and the North East and Mr Newton is confident that the business can achieve 20 per cent profitability within a decade. The journey of Knaresborough-based Newtons has been a genuine Yorkshire success story. However, this impressive law firm had somewhat less auspicious beginnings, as Mr Newton concedes. The solicitor had been working as a full equity partner with a firm in Harrogate. However, as the full chill of the recession began to hit in 2009 Mr Newton decided it was time for him to go it alone. 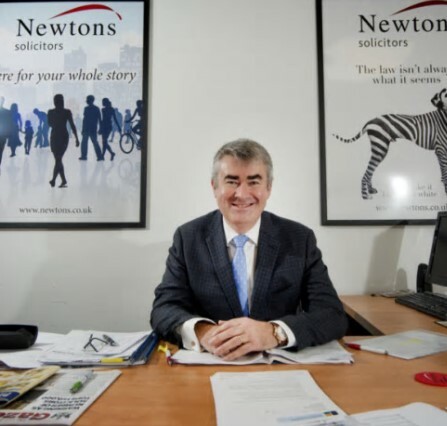 Having negotiated a deal with his firm that he would be free to approach clients, and with a holiday booked, Mr Newton took his first formative footsteps into the world of entrepreneurialism – from a business centre car park in Cornwall. Faced with limited options for communication, Mr Newton approached the proprietor of a baker in the town local to where he was staying and asked if he could use his fax machine. Messages duly dispatched, Mr Newton got in his car and drove to the one place he could find with decent phone reception. “I had a flask of tea and a phone charger and I spent all day phoning clients. “It was a huge step. I spoke to my wife about it when I was thinking of making the move. She said, ‘Are you sure you know what you are doing?’. And that was the beginning of it.” The first chapter of Newtons Solicitors was equally inauspicious, with Mr Newton working from his home with a laptop and a phone. However, the move was far from a leap into the dark, with Mr Newton having a clear plan in place for the firm’s foundation. “I knew I would have a certain level of work follow me,” he said. “However, I did not expect the level that did follow me. I found I was going out everyday with my brief case to see people and coming back with a briefcase full of papers and thinking ‘this is great’ but also ‘when am I going to do all this work?’. “To begin with we worked as a virtual law firm. I would say to people ‘I have cut back on my overheads and I will pass those savings on to you’, so you had me doing the work at 25 per cent cheaper.” It soon became apparent that the caseload was simply too great for one man. And luckily Mr Newton had people wanting to follow him, “I then had my old team saying the wanted to join me,” he said. “I was naturally concerned about taking on fixed salaries but I could say to my clients that they could have the same team at a lower cost.“So this worked really well and in the first year we took about £300,000 in fees. “Now at the stage where the business had outgrown the mantle of a virtual law firm, Mr Newton knew it was time to expand. He bought the firm’s first office in Knaresborough and started taking people on on a fixed salary basis.It was around this stage where the streak of entrepreneurialism that had existed in him since childhood began to truly awaken. He realised he had to scale up.“I knew I needed to grow,” he said.“I wanted the chance of making it big, [ I knew] I might fall flat on my face but I have got to take that chance.”He added: “Bizarrely, it never occurred to me to start a business in the profession I know. Were it not for the recession I would not have done it.”A series of new offices openings and acquisitions were put into motion that continues to this day. In addition to the current 12 offices, Newtons has three more that are in the process of being set up. “It is a formula that I want to keep rolling out, funding permitting,” Mr Newton said. As for the business, Mr Newton has three core aims he seeks to deliver each day, namely to have a happy team, happy clients and a successful business.Despite being based around the legal powerhouse of Leeds, Mr Newton said he has no ambition to create a footprint for his business in the city, preferring instead to concentrate on the market towns and smaller cities in the north of the country that has brought him so much success.